The next time Macnee appears as Watson is in two mini-series with Christopher Lee as Holmes. Again Macnee gives two quite good interpretations of Watson but just a little to the Nigel side. Is it just me or do all the Watson’s seem to do rather well except when Holmes appears with them on screen? (It is only then that the Gabby Hays Character appears in their performances.) There are two versions of both “Sherlock Holmes and the Leading Lady” and “Sherlock Holmes: Incident at Victoria Falls”. There is the long mini-series version and a cut down DVD version. I have watched both and there is a tremendous amount lost in the cut down versions, even to the point of some scenes not making sense because of missing information. In the full versions they are well worth watching. The subtitle of these mini-series was “The Golden Years”. I wish they had made more. Macnee also played the Great Detective in a Canadian production in 1996, “Sherlock Holmes: The Case of the Temporal Nexus” and the 1994 “Hound of London”. Patrick Macnee was born 6 February 1922 in London England to a fairly wealthy family. His father was a successful racehorse trainer but also a gambler and known to take a drink. He left wife and son and departed for India. Patrick’s mother was a niece of the Earl of Huntingdon (descendants of Robin Hood) and moved in with her female lover who Patrick knew as “Uncle Evelyn”. At three he was packed off to school. He was eventually expelled from Eton for running a bookie operation. He then attended Weber Douglas Academy of Dramatic Art on scholarship and by 1941 had started his formal acting career. From 1942-46 he served as an officer in the British Navy. Once the war was over he really found his footing, constantly traveling between the U.S., the U.K. and Canada making scores of TV and movie appearances. In 1959 he became a U.S. citizen. 1960 was to be the banner year that would make Macnee recognizable to the entire world: “The Avengers” appeared on TV! 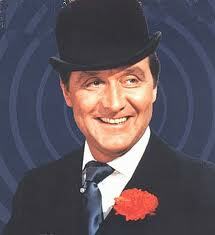 In case you can’t tell, Patrick Macnee is one of my favorite actors. This entry was posted in Doyle, Holmes, Watson. Bookmark the permalink.